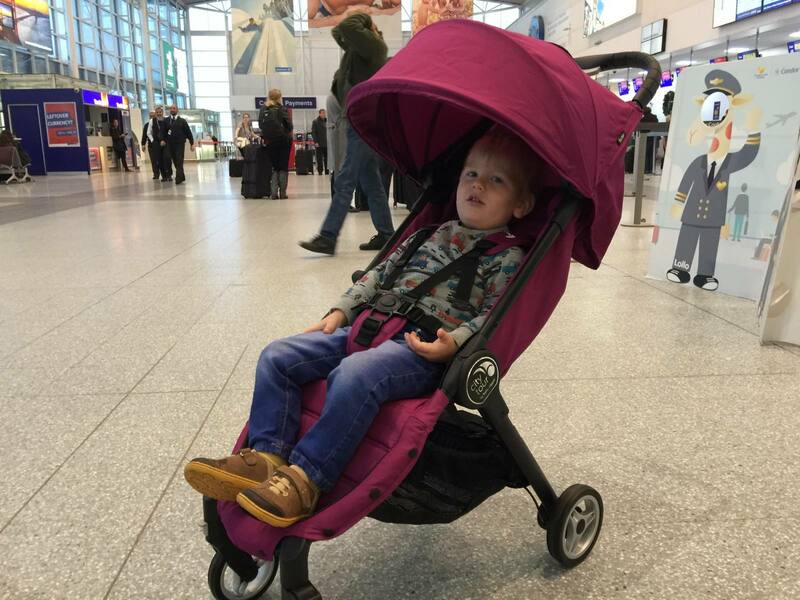 We were thrilled to receive a Baby Jogger City Tour pushchair to review. It is a super compact, lightweight, and easy to maneuver buggy, that fits right into our lifestyle. 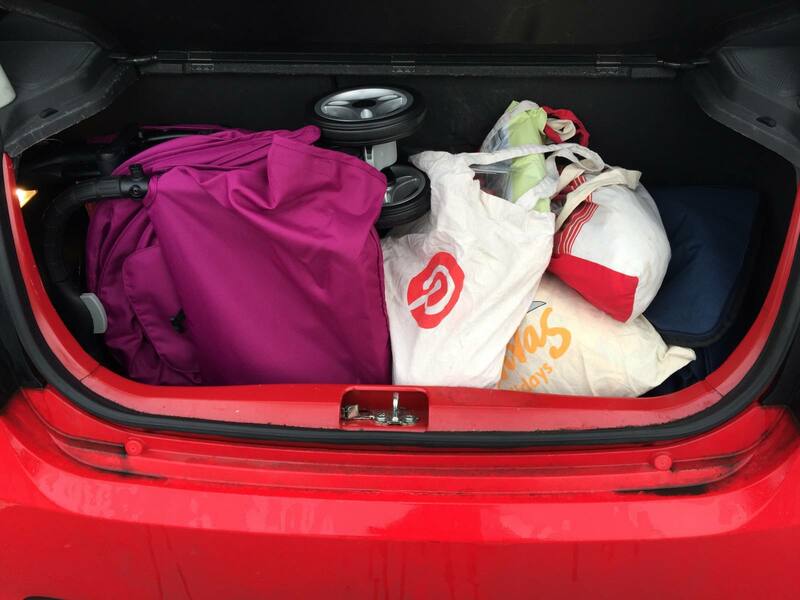 Living in a flat we are short on storage space, and I drive a car with a very small boot. 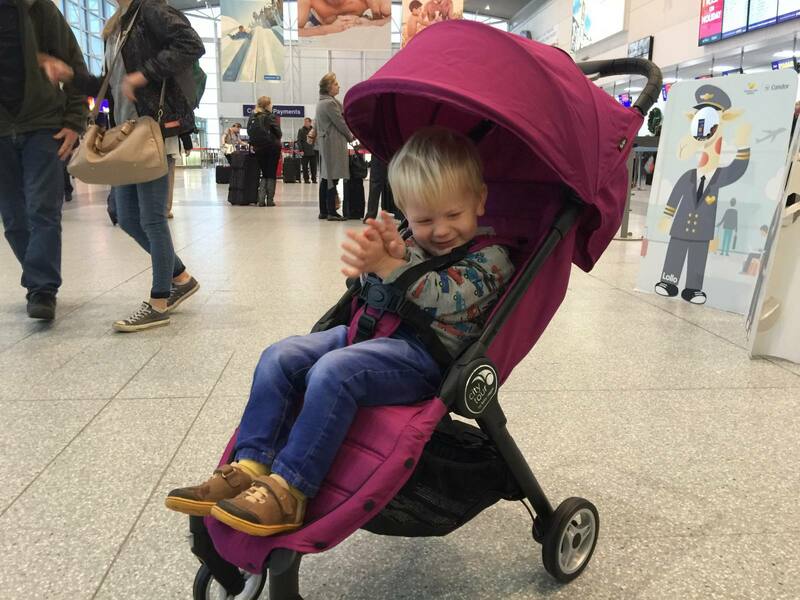 We also love to travel, and this pushchair relates and addresses all of those challenges in one fell swoop. The Baby Jogger City Tour is a stroller suitable for children aged 6 months and older. Noah is just-turned-two, and he fits it really well, with some growing room, even though he is very tall for his age. The buggy arrived in a very small box, and was ready to use in just a few seconds after popping the wheels on. It unfolds using a very intuitive system of unclipping the bar that secures it on the side and then a flick of handle. They say you can do this one-handed but I haven’t mastered that yet. Lets start at the top and work down the Baby Jogger City Tour stroller, which is jam packed full of features, despite it’s compact size. 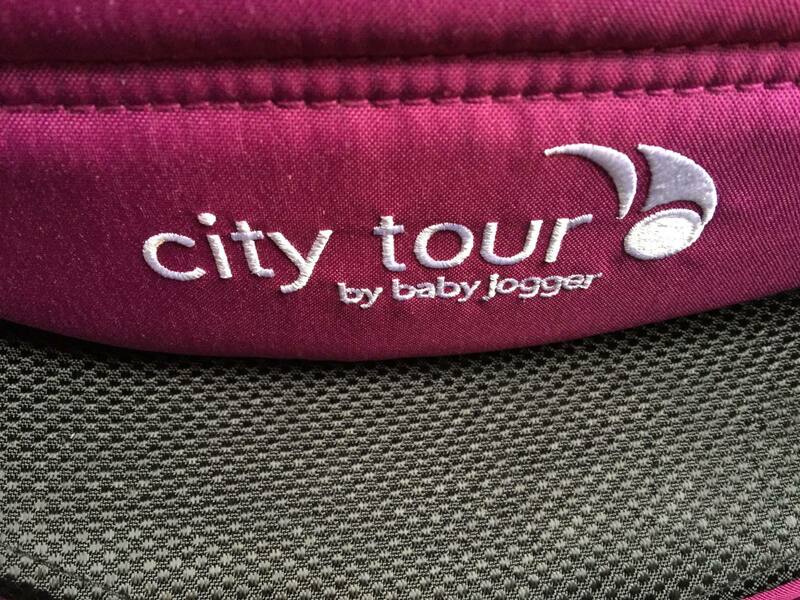 The Baby Jogger City Tour handle is not adjustable. It is a really good height for me (I’m 5’7″) and it’s not too low for Rob at 6’4″. With an umbrella stroller, you are often crouching down to hold the handles and steer the pushchair making them uncomfortable for all-day use. The handle of the City Tour, however, is pretty well placed for average-height and tall parents. 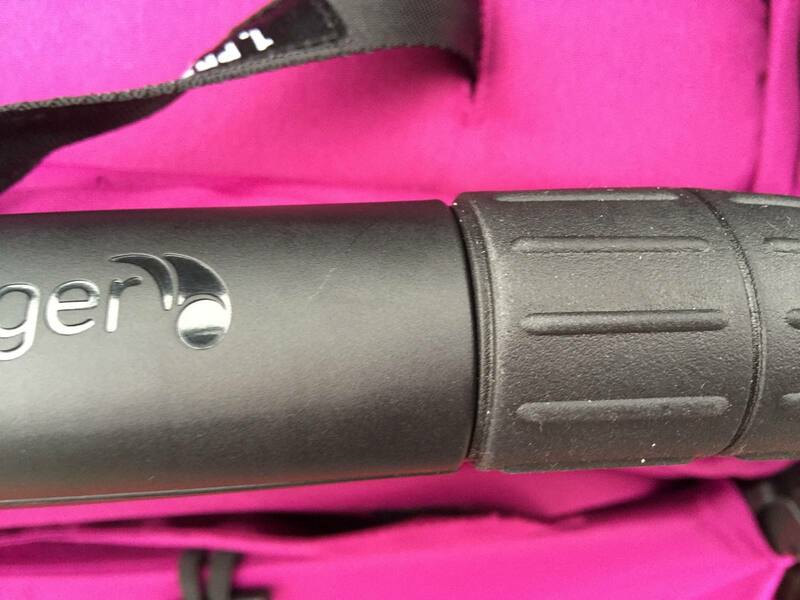 The handle is rubberised in the middle, making it comfortable to grip and will last longer than foam-covered handles. The City Tour has an awesome hood, which is SPF50+, so perfect for sunny days, as well as windy spots where you just need your child to have a bit more protection. The hood comes right down to cover half of the pushchair. The viewing window on the top is held on with two small spots of hook-and-loop fastener, and is a really good size – the best I’ve seen in the pushchairs I’ve tried before. There’s a piece of mesh fabric to cover the hole, so you don’t get hands popping up, unexpectedly, out of the hood through the peep hole! 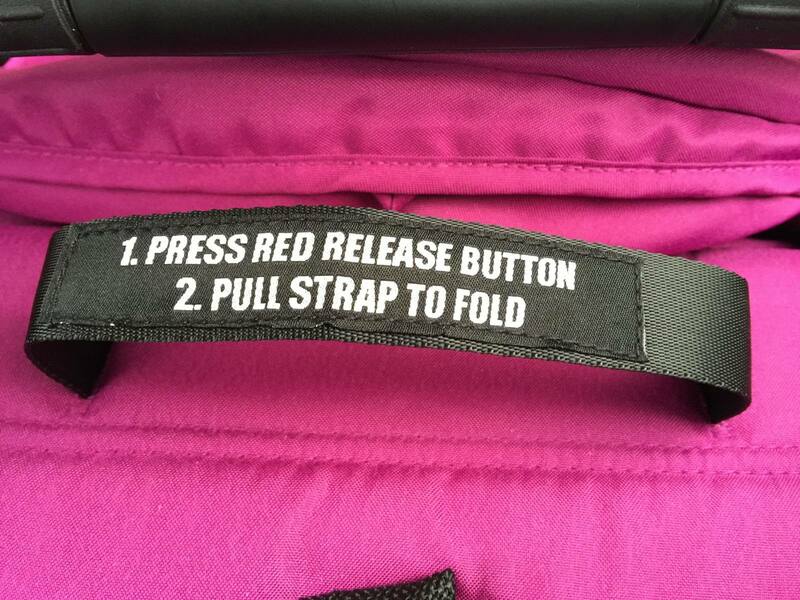 This stroller has a five point harness, which clips very easily together. It actually has a pretty clever design which you might not need when you’ve a small baby, but as you begin to push a toddler around you’ll appreciate. The straps that go over the shoulders can be separate from the waist section of the straps. 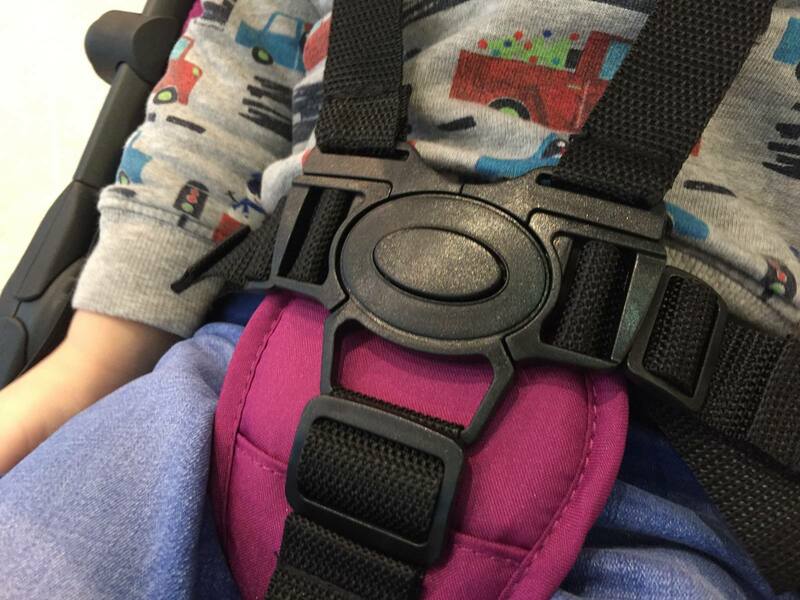 So, if your toddler likes to sit up and look about, without leaning too far forwards, you might prefer to just have them strapped in around the waist. The clip of the City Tour slides together to make a three point or a five point harness. Neat, huh? If you don’t like that feature, it doesn’t pop out super easily, but if it began to annoy you, I’m sure you could squeeze a spot of super glue in there to shut it up forever and maintain a 5-point harness. The seat of the City Tour is suitable for 6 months and older, which means it doesn’t lie flat. So you’d have to use a different means of baby transportation for the first six months or so, like baby wearing, for example. The seat is reclined using a toggle at the back. You can push it so that it’s very upright, or lying down, or precisely anywhere in between that your child likes – there are no preset positions for this recline. Although it is a really compact stroller, that hasn’t compromised the ride comfort, and it doesn’t seem to be a very narrow chair. Noah fits well into the stroller, and there’s enough room for him to tuck his hands down next to his sides when he sleeps, as is his habit. The seat is padded, and feels like a good, durable fabric. Apparently the seat is actually washable, which is surely a mark of a pushchair company who know their market all too well. Well done, Baby Jogger, well done. There is a tiny foot rest on the Baby Jogger City Tour stroller. It’s just enough to rest tired little feet on, and doesn’t make the pushchair any less compact. Noah isn’t quite reaching it yet, so I’m guessing an average 3 year old will be able to comfortably rest their feet. The whole of the calf is well supported though, as the seat comes right down. If it had a flip-out feature to make the leg rest pop up during naps, this would have really impressed me and made this buggy tick every single box, but it’s such a small thing I doubt it would be an issue for many parents. There are four wheels. I think you often think that pushchairs with four wheels are less easy to maneuver, or clunkier, than 3-wheelers, but that doesn’t prove true with the City Tour. It is so easy to push, and steer, one handed. There are little strips of rubber in the centre of each wheel, which make the ride quiet on most pavements. Front-wheel suspension ensures the ride is pretty smooth and comfortable for little ones. I’d say one of the most important features to many parents is the under stroller storage basket. This is a good size. You’re not going to get your whole weekly shop in there, but if you have popped to the shopping centre this will hold an average bag. I think you’d be best using the clips on your changing bag to attach it to the handle of the City Tour than using the basket to carry a change bag, unless you really like to have it underneath, out of the way. An additional feature of this pushchair is that it comes in its own bag. The bag has padded shoulder straps and as the City Tour is so light at just 14lb, it is comfortable on your back. When you want to take it out of the bag, you simply fold the bag up, and zip it into the compartment in the basket underneath. Alternatively, if you’re never going to use the carry bag, you’ve got a secure, zippable pouch to carry something; maybe a spare nappy? There’s also a behind seat storage pouch. Click here to see how the Baby Jogger City Tour fits into major airlines cabin requirements. This pushchair is designed to be ideal for modern life, in cities, and during travel. It folds up really small. It’s really easy to manage to fold this buggy up without reading the instructions. You simply press the red button, and the top part swings down over the seat. Next, you grab the strap that will be right next to your hand, on the seat. Pull that and the City Tour is folded and ready to slip inside the carry rucksack it comes with, or simply for you to slip into your car as it is. The boot of the car I drive is tiny. It’s only 160 litres, which has meant that with all previous pushchairs, that I can’t use the parcel rack. I also have had to choose between shopping or buggy. And if I’ve got the buggy I absolutely cannot take a passenger in the front seat if there’s any danger of them having more than one bag that they can carry on their lap! So the City Tour stroller has changed my life! Look at this! I can get a pushchair AND shopping in my tiny car boot! I have been able to use the parcel rack, which increases security in my car. This is such a useful buggy for every day use. It’s worth noting this pushchair does not come with a rain cover, cup holder, or bar, although all three are available to purchase. 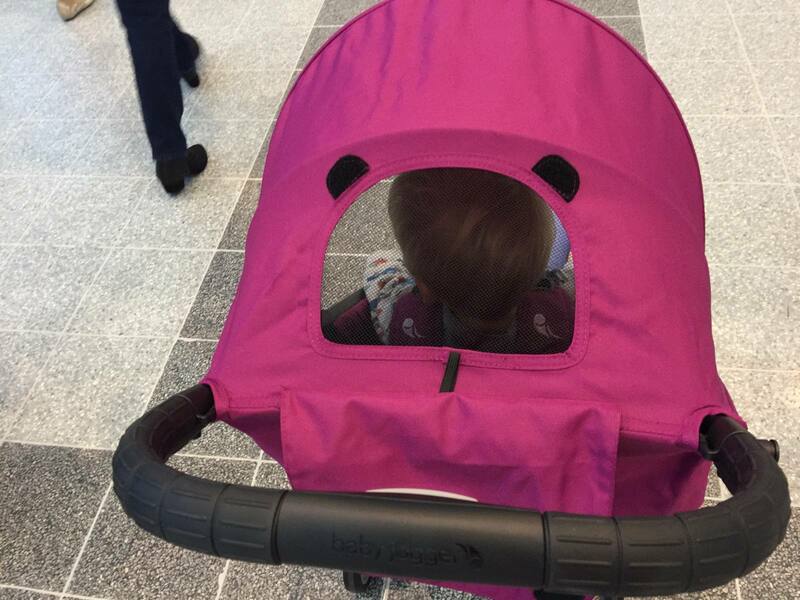 In the UK the stroller comes in three colours; violet (shown here), onyx – black, and juniper – green. It retails at around £249.99. 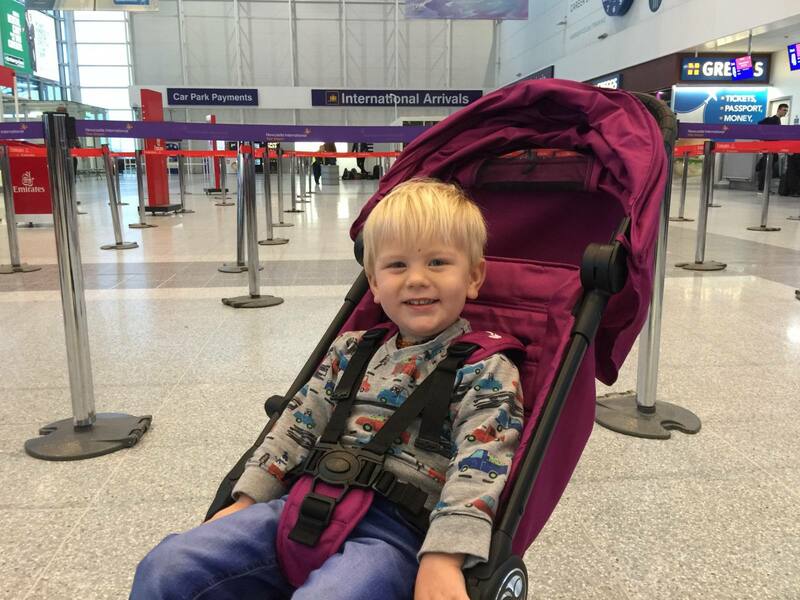 Baby Jogger City Tour – Can I take it on the plane? It’s looks a great stroller for travelling with and one that will last until they out grow it. It is a shame that it doesn’t come with a raincover as standard. Yes, I totally agree; a rain cover is needed just about everywhere you are, home or abroad. Yes, it’s teeny tiny, and so light. Brilliant bit of kit! I have concerns over the depth of the seat, it seems so shallow and could be uncomfortable when LO is older…. You mentioned you son was comfortable and it was wide enough. What are your thoughts on the depth. I think the seat of the Baby Jogger City Tour is quite shallow; it has to be in order for the whole thing to be compact. 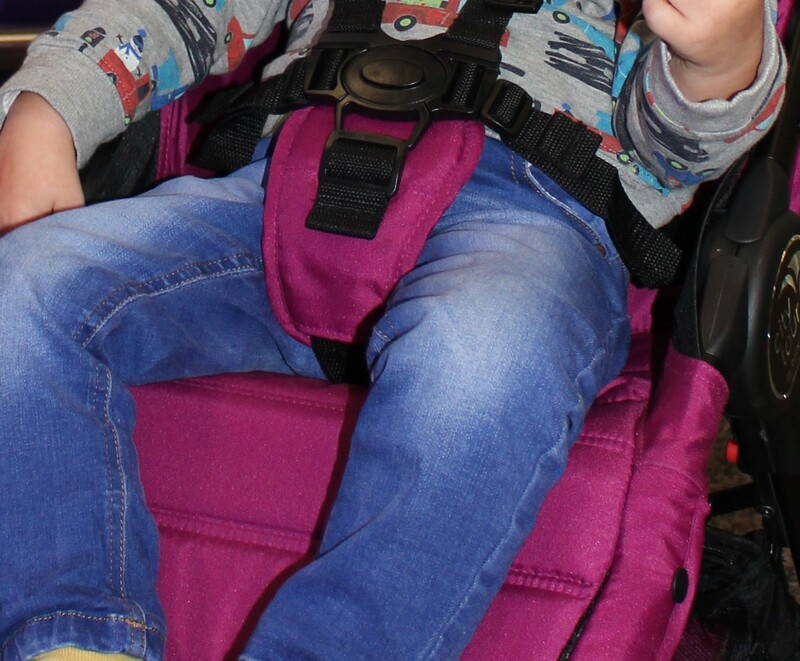 But, my 4 year old sits in the pushchair when he wants to, and he doesn’t seem to be uncomfortable at all. As the child gets older they will be able to reach the foot rest and use that to support their legs. Hope that helps, but if you’d like me to I’ll take a photo later this week if I can persuade my older child to sit in the stroller. I could email it to you if you’d like? I’d be interested in your thoughts/pics on that too! This is the one thing in some negative reviews that has me concerned. People said they felt the only thing keeping their kid in the stroller was the straps, they kept sliding. Otherwise we really liked how the stroller felt in the store. Sure, I’ll do my best to get a photo later this week and show you the seat of the City Tour. Thanks so much for responding. After a good search of reviews online and speaking with the local shop, I purchased it this afternoon and am happy with it. It’s our 2nd buggy for when we’re traveling and really is ideal. Speaking with the local shop they were saying once a child is big enough to place their feet on the foot rest, that position will help keep them comfortable in the seat…. Which makes sense. I just bought this stroller too and i love it. The only thing that concerns me is the seat, is it comfortable enough for my baby. Do you think adding a memory foam liner will make a difference?? I’m not convinced you’d need one. After all, the baby jogger city tour has suspension, and it seems like a really comfortable ride. The seat is padded. At least, my kids go to sleep often while they’re being pushed around!